Thailand has long been a highly popular destination for families, understandably given its friendly, welcoming reputation coupled with fascinating culture and fantastic food. This two week trip is packed full of activities and experiences to give you an insight into traditional Thai life. Stay in raft houses on the River Kwai, walk through dense rainforests, put culinary skills to the test and relax on Thailand's tropical beaches. Day 1 - Join tour Bangkok; optional city tour by tuk tuk. After checking in to our hotel base for the next two nights, the rest of the day is free to use as you wish. You may choose to join a sight-seeing tour this afternoon. Travelling by tuk-tuk, you will head for the magnificent Grand Palace, where a local guide will show you around. Regarded as the most impressive site in the city and dating from the 18th century, this huge edifice represents the re-emergence of the Thai nation, after years of oppression by the Burmese. Its unrivalled collection of palaces, golden stupas, Wats (temples) and ornately decorative statues are definitely worth exploring. The tour continues by foot to the rambling complex of Wat Po. Older than the city itself, this is home to a reclining Buddha which is a 46 metre golden plated statue depicting Lord Buddha as he enters Nirvana. After our briefing this evening, we can look forward to a tour of a small street food market in nearby Wat Saket which gives a wonderful example of local life and its customs, Dinner tonight is at a restaurant which reputedly serves the country's best Pad Thai. 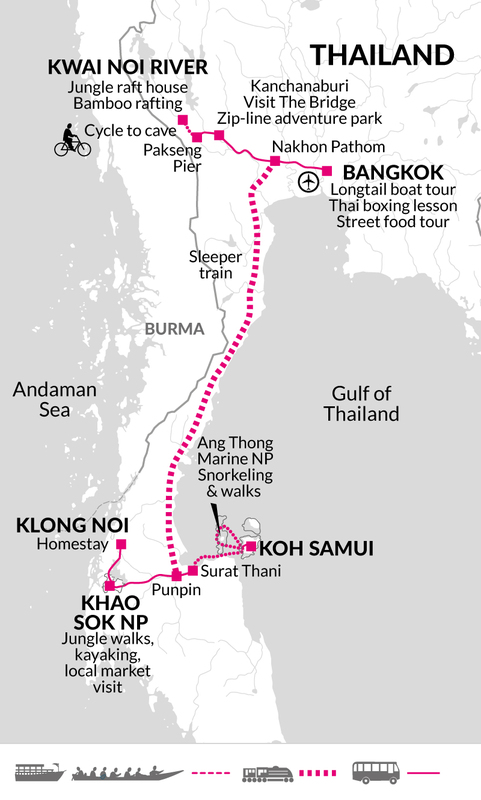 Day 2 - Thai boxing session and tour of the city by long tail boat. This morning, we visit the Sor Vorapin Gym - the famous Muay Thai training camp, where we will watch Thai Boxing experts in action. Afterwards, we will have the chance to try out training techniques of the traditional martial art in a training session (there are showers). This afternoon, we head to Tha Tien Pier where we cruise in a traditional long-tail boat along Thonburi's klongs (canals). This is the ideal way to explore Bangkok's network of meandering waterways that continue to serve as an important thoroughfare in the city. Along our route, we watch local life taking place around us - vendors pass by on small wooden boats that are filled with vegetables and noodles to be sold to canal-side homes. We may even see the postman making his deliveries in his engine-powered banana-boat. This evening, we head to Siam Paragon Food Court, where we can enjoy a traditional Thai food dinner with the opportunity to shop in the area for souvenirs before we return to our hotel. Day 3 - Optional cookery course; Afternoon boat trip along Kwai Noi River. After visiting a local market this morning, you have the opportunity to take part in a Thai cookery lesson, in which you can create up to three different dishes. Five basic flavours make up Thai cuisine - sweet, sour, salty, creamy and spicy and you learn how to combine these rich tastes with the freshest ingredients. This afternoon, we drive to Pakseang, in Kanchanaburi province where we board a long-tail boat for the 45-minute journey to our raft house accommodation on the Kwai Noi (River Kwai). We spend the next two nights in this spectacular jungle setting with the rest of today free to relax and enjoy at your own pace. The resort is located in tranquil and natural surroundings of tropical forests and scenic mountain ranges with an eco-approach that includes having candles and lanterns rather than electricity, preserving the Mon culture by including traditional furniture within the lodges and assisting in providing decent living conditions for the elephants in the area. The river flows underneath the floating rafts with guest rooms made from bamboo that are weaved into the wall reflecting traditional Mon living. Day 4 - Bamboo rafting; Afternoon cycle to limestone caves. Day 5 - Try out a 40 station zip-line, visit the Bridge over the River Kwai and take an overnight train. We board our private long tail boat to a local pier and drive to Kanchanaburi where we experience an adventure climbing and zip-line park. The park offers an extensive zip-line adventure canopy within the forest where you travel from one platform to another through an assortment of rope bridges, Tarzan swings, flying skateboards, a tight rope walk and zip lines. For customers wishing to relax during this time, there is a swimming pool and hot spring pools within the complex. There is a minimum height restriction of 140cm to undertake this activity. We then travel to the infamous 'Bridge over the River Kwai', where over 16,000 allied prisoners of war and an estimated 75,000 Asian forced labourers lost their lives building the 'Death Railway'. One of the most notorious atrocities of the Second World War, the bridge and railroad were built between June 1942 and October 1943 by the occupying Japanese to link Siam with neighbouring Burma (Myanmar). After spending some time at the bridge, we continue on to the railway station at Nakhon Pathom, from where we board the overnight train south to Punpin and the Gulf of Thailand. Berths are not in compartments, but are arranged open plan either side of a central aisle. During the evening and morning part of the journey, pairs of seats face each other on each side of the aisle. At night, each pair of seats pulls together to form the bottom bunk, and an upper bunk folds out from the wall. The attendant will make up your bunk with a proper mattress and a pillow, bedding and blanket. There's plenty of luggage room. A steward or stewardess from the restaurant car may come round and take your food or drink order, offering you a set menu with several choices, around 180 baht for dinner and 100 baht for breakfast. The meal will be delivered to your seat although you may want to have this in the restaurant car. Toilets and hand wash sinks are located at the end of each carriage. Day 6 - Arrive Punpin and drive to homestay in Klong Noi. This morning our train arrives into Surat Thani and we take time to explore the morning market and take breakfast. It's then a short transfer to the Homestay at Klong Noi, a small village located in a mangrove forest near the coast. We meet our hosts for the night, one of many local families who participate in the Community Based Tourism program, an initiative set up to empower local communities to not only showcase but also help preserve their traditional way of life. We then visit the local shipyards and learn how the locals have made boats over the years, something that is vital to their way of life. Following lunch with our host families we set off to explore the mangrove forests by boat, looking for fish and wildlife along the way. The area is famous for its tiger fish and we should have plenty of chances to spot them. The village is also a great place to learn the art of weaving with palm leaves. In the afternoon we return to our host families and help with the preparation of our dinner. The evening is free to relax and spot the local fireflies lighting up the night sky. Day 7 - Khao Sok National Park; jungle canoe adventure and free time. Following breakfast we bid farewell to our hosts and drive to our jungle adventure in Khao Sok National Park. Covering an area of some 65 square kilometres, the park is one of the oldest and most bio-diverse jungles in South East Asia, boasting a lush rainforest that is older than those of either the Amazon or Central Africa. Set against a spectacular backdrop of towering limestone mountains, it is home to a rich diversity of wildlife, including elephant, tiger and the Malaysian sun bear. With some 180 species of birds in residence, it is a haven for keen birdwatchers and novices alike. Head out on a guided walk through the surrounding jungle keeping eyes peeled for mischievous monkeys playing in the canopy above and watch out for colourful hornbills and kingfishers as they dart amongst the trees. The park is a haven for a wide variety of exotic plants, including bamboo, fig, palms and the carnivorous pitcher plant. The rest of the day is then free to indulge, explore or relax as you see fit. Our jungle lodge accommodation will be our base for the next two nights. In this magical setting, we can look forward to the sight of monkeys descending from the surrounding canopy to drink from the river. Day 8 - Full day in Khao Sok National Park, walking and canoeing safari. Our second day in the jungle sees us exploring by canoe. 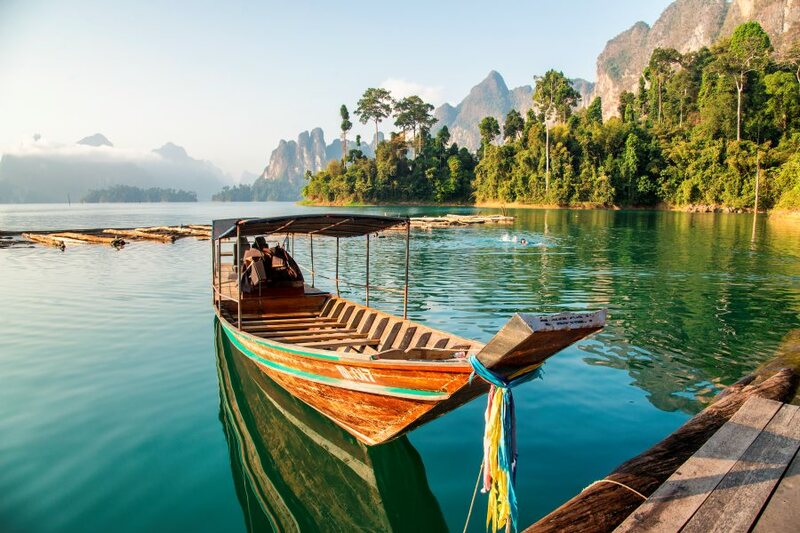 Gently floating down the Khao Sok River, this is a very relaxing way to take in the astounding surrounding beauty. Passing towering cliffs and shoals of vibrant fish, we have the chance to break our journey with a swim in the cool waters. Along the way, our guide will show us brightly coloured birds and monkeys on the shore, and maybe even a snake or two hanging high up on the trees. The rest of the day is free for you to spend as you wish. This evening, there is the option to go on a walking jungle safari and witness the jungle bursting with life at night. Day 9 - Ferry to Koh Samui and transfer to beach accommodation. Transferring by road to Don Sak Pier, we then catch the ferry to Koh Samui. This island is the largest in the Samui Archipelago and is known for its distinctive mix of quiet palm- fringed beaches, backpacker resorts and coconut plantations. Our beachside accommodation for the next two nights is in the north of the island. This area is more relaxed than the bustling east coast and retains a laid back atmosphere that is perfect for families. The rest of the day is free for you to relax and explore at your own pace. You may choose to take to the waters with mask and snorkel, or simply wander the palm-fringed beaches and trails around the island. Koh Samui has a slightly different feel to many of the other islands in southern Thailand, owing in part to the influence of the Hainan islanders, who first settled the island 150 years ago. The Chinese influence is still visible in some of the buildings in Na Thon, and some descendants of the original settlers still live in the area. Day 10 - Free day on Koh Samui. Today is a free day to enjoy Bang Rak beach or relax by the pool. Take a tuk tuk to lively Chaweng beach, located just ten minutes away from our hotel. Koh Samui offers a little something for everyone with numerous white sandy beaches, coral reefs, hip restaurants, lively night spots, waterfalls, temples and great shopping opportunities; the choice is yours. Today we will visit the beautiful chain of islands that make up the Ang Thong National Marine Park, an idyllic archipelago made up of over 40 islands, once renowned as a haven for pirates. This stunning archipelago's reputation now centres on its pristine beaches, remote bays and virginal rainforest. These limestone islands are home to sea otters, monitor lizards, dolphins and wild pigs. Our day will be spent walking, snorkelling and swimming in this beautiful setting. Today's free time affords the opportunity for more swimming, beachcombing and relaxing on the island. Alternatively, there is the option to partake in another Thai cookery course. We later take the ferry back to Don Sak on the mainland, from where we transfer to Surat Thani for our overnight train back to Bangkok. After arriving in Bangkok and transferring to our hotel, the rest of the day is free to use as you wish. You may choose to visit the Rattanakosin Exhibition Hall - just a short distance from our accommodation. This interactive museum is regarded as one of the best in Thailand and helps to bring Bangkok's history and culture to life. Another option is a visit to Wat Saket, known as The Golden Mount. Here, a Buddha relic is housed in a gleaming gold temple, attracting worshippers throughout the year. Alternatively, you may choose to visit Siam Ocean World - one of the largest aquariums in South East Asia. Our tour ends today in Bangkok. Generally hot with high humidity. There is some rainfall from April to September with most days being hot (around 33 Degrees) and a light breeze on the islands. If it does rain, it will be more of a heavy tropical downpour that lasts a few hours. Additional information and climate charts can be accessed at http://www.explore.co.uk/weather. Bangkok - Long tailed klong boat trip $18; Thai massage from $7; Jim Thompson's House $30, Thai cookery course $38. Koh Samui - Thai cookery course $38. Krabi - Half day kayaking $28 (adult), $21.50 (under 12's). Full day kayaking to Koh Hong incl. lunch $56 (adult) $43 (under 12's). Thai cookery course $33. Pack essentially for \ Hot Conditions\ . Bear in mind that the region is tropical (humid) and that days can be very hot. Lightweight rainwear or an umbrella is advisable all year. Casual clothes are the most practical (something with long sleeves, and long trousers for evenings and also for the forest treks), and tight fitting garments should be avoided. Bring a swimming costume. Laundry facilities are available on the islands. Please Note: shorts, vests, revealing or casual clothes and open backed sandals are not permitted in the Grand Palace. Comfortable shoes and sandals. Flip-flops are useful when hopping on and off boats. them if intending to dive. You should also bring a cycling helmet for the trip to the caves on day 4, as local equipment may not be sufficient. For this we suggest £20 per family member. We recommend that you bring your money in GBP or US$. Most major towns and on the islands - your Tour Leader will advise you on arrival. ATMs are available in Bangkok but are limited on the islands. Can be exchanged at banks and exchange offices throughout the tour although rates may not be as favourable. Our hotel in Bangkok offers an outdoor pool, gym, large restaurant serving international and local cuisine and a grand lobby. Rooms are spacious and include all the standard facilities. The hotel is a great introduction to all the families' trips. The River Kwai Jungle Raft is a special place that does not have electricity has great character. The Jungle Raft is held on a floating platoon type structures. The rooms have a bamboo design with twin beds and mosquito net and a toilethower room. Although we are provided with a small torch and gas lamp it is best to also bring a large torch. The restaurant area has a similar design and is large although with a theatre where the staff entertains with a Burmese traditional dance each night. The overnight train has berths (not in compartments), arranged each side of a central aisle. At night, each pair of seats pulls together to form the bottom bunk and an upper bunk folds out from the wall. The attendant will make up your bunk with a proper mattress and a pillow, bedding and blanket. Although an experience, you do not get a lot of sleep. The accommodation in Khao Sok is set in jungle type terrain with individual wooden chalets within the grounds with a central main building and a lounge and restaurant area plus a pool area. The accommodation is in twin or triple (double and single bed) with electricity, shower/toilet, veranda and mosquito nets. The accommodation is close to the gates of the national park and is located in jungle grounds. Thailand: Visas are not required by UK, Australian, New Zealand, US and Canadian citizens for a stay of less than 30 days. All passports must have at least 6 months validity remaining on entry to Thailand. Other nationalities should consult their local embassy or consular office. Nothing compulsory, we recommend protection against malaria, typhoid, tetanus, diphtheria, polio and infectious hepatitis. Although not compulsory, travellers may also wish to immunise themselves against Japanese encephalitis. Consult your travel clinic for latest advice on Malaria and Zika Virus. Please take preventative measures to avoid mosquito bites - these include mosquito repellent as well as long trousers and long sleeve shirts to cover up when necessary. Please check the latest requirements with your travel clinic or doctor prior to departure. The above is not an exhaustive list. Further information regarding vaccinations and travel health advice can be found by following the NHS and NaTHNaC links at Explore Travel Health and from your local healthcare provider. Visa and vaccination requirements are subject to change and should be confirmed by you before travelling. Triple Rooms: This trip allows the option for triple rooms to be included within the booking on all nights of this trip with the exception of the overnight trains. If you would like this option, please ask our Sales team for further information. Average Age: As a guide we have identified the actual average age of the children who have travelled on this trip over the last 5 years, to help you decide whether it's the right one for your family. The average age on this trip is 15 years old. This tour is designed for families who want an active and relaxing holiday all combined into one adventure. The active elements are varied and sometimes unusual - how about bamboo rafting, jungle walks and a Thai boxing lesson. The holiday also provides cultural highlights such as visiting the Bridge over the River Kwai as well as opportunities to meet the locals with time in a school and visiting local markets - a diverse adventure that covers the country.